A mod that allows for global GameRules that applies when a world is loaded. When locking a worlds difficulty it can't be unlocked again and it's done after any difficulty changes. A locked world won't have it's difficulty changed when loaded. All changes made to the GameRules or the difficulty in one world is applied to all other worlds when they are loaded and saved to the config. 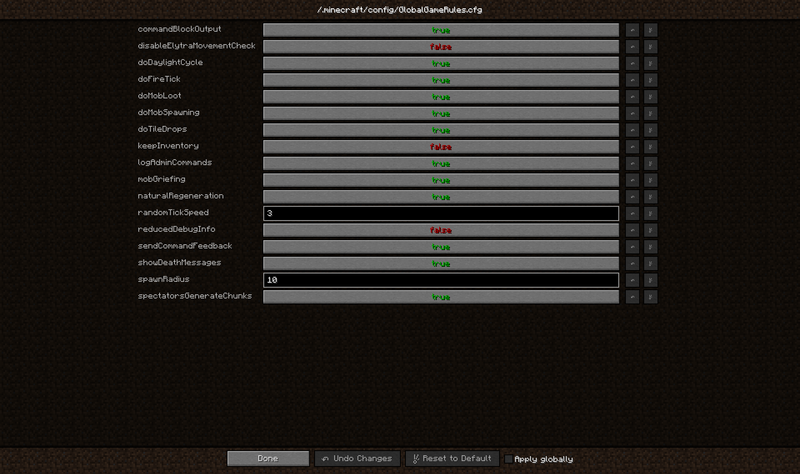 Changes made in either config file or in-game config gui is applied on world loads. You are free to use my mod in your mod pack. Is it possible to have custom mod command run only once on world/dimension gen? from Ruins on worldGen for the Overworld, and another on dimGen for the Nether and the End. Does that look possible at all? Do you think it could be feasible in the future though? or is it too complex/useless to implement? Is it possible to put custom commands in the config? Would it work? Otherwise, can you put a custom rule with similar effects to /recipe give @p * ? Basically, unlock all recipes from the start of the world, but also for any player that joins after. The latest version has support to do this. Thank you for creating & sharing this, I've been using it for a while now on older patches. Any link for builds for 1.11.2? The 1.11 version will work with 1.11.1 , 1.11.2 . The source used 1.11 MCP snapshot mappings . Just drop it in the /mods/1.11.2/ , folder . Anyway to set clients to default to peaceful mode when creating new worlds in single player? Trying to get this for a pack I'm working on. 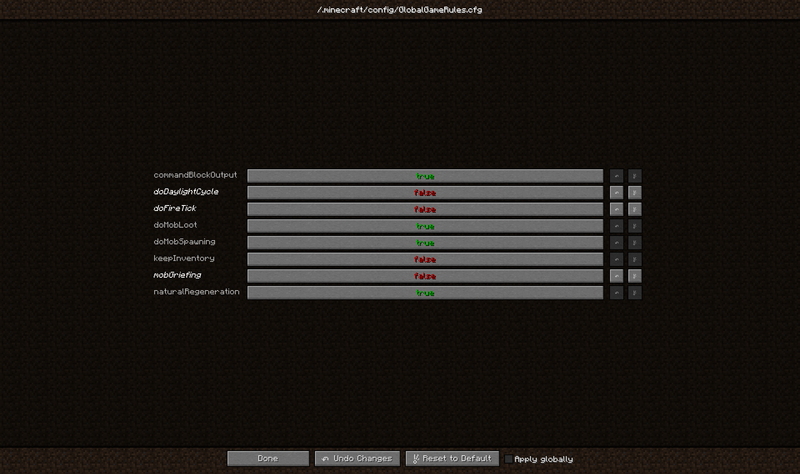 With the latest version you can set the default difficulty when a world is loaded. Oh I see it on Github now. Maybe it's just not approved here on Curse yet. Thanks so much! 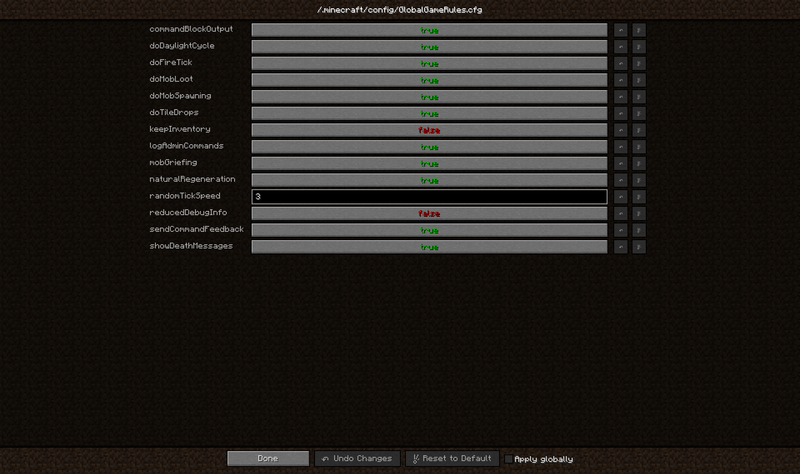 Hey, I am going to be using this in a modpack I am working on in order to make reducedDebugInfo be true by default. 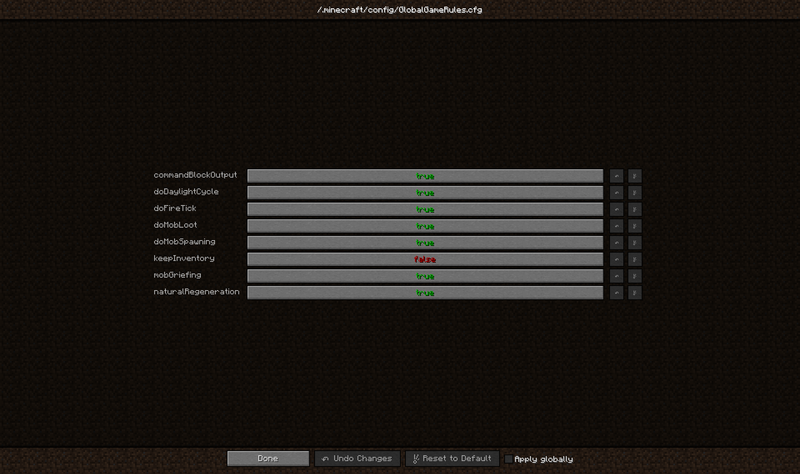 But before I do, I want to make sure you are still developing this... so... are you going to be updating this to 1.10? Thanks. Can you port it to 1.9.4 please?